 by Olenka Z. Pevny, PhD. Scholar fears Church of St. Cyril in Kyiv is the latest victim of political intrigue. "St. Cyril teaches the King"
Alarming news has come from colleagues in Kyiv regarding the preservation of Ukraine's most important twelfth-century monument - the Church of St. Cyril of Alexandria (Kyrylivs'ka tserkva). Through a series of what appear to be deliberately devious actions it appears that the Church of St. Cyril, which was part of the Cultural Preserve of the Cathedral of St. Sofiia - a UNESCO site, has been deprived of its protective status and a free hand is being given to the Ukrainian Orthodox Church of the Moscow Patriarchate (UOCMP) to remodel the interior of the monument. 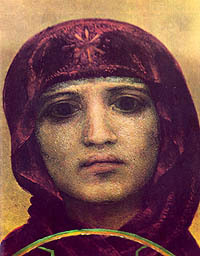 This includes the overpainting of murals by such prominent nineteenth-century artists as M. Vrubel and M. Murashko, and, even more significantly, the desecration of unique 12th century frescoes. Among the truly irreplaceable compositions in the church is the life cycle of the 5th century Patriarch of Alexandria, St. Cyril. Images from the life of this saint occupy the entire east apse of the Kyivan church and constitute the only representation of the life of this church father in the world. 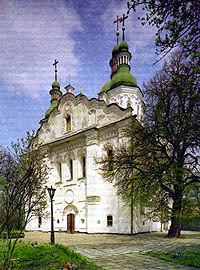 Without exaggeration, the Church of St. Cyril is the most important 12th century monument in Ukraine. Its medieval frescoes are unparalleled not only in terms of Kyivan Rus' visual culture, but also in the context of Middle Byzantine art. The Church of St. Cyril of Alexandrian is a monumental princely foundation built by either the Princess Maria Mstyslavivna or her husband Prince Vsevolod Ol'hovych (r. 1139-1147). It served as the burial chapel of Maria and her offsprings. 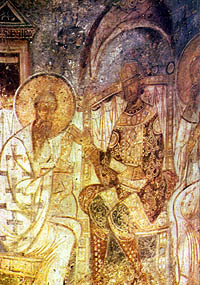 The medieval frescoes of the Church of St. Cyril are the only specimens of monumental 12th century Orthodox iconography to survive in the former Rus' (see Kievan Rus' - History of Ukraine) and present Ukrainian capital city, Kyiv. 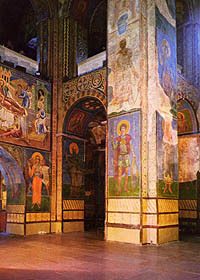 Together with the Church of the Savior in the Mirozh Monastery in Pskov, Russia, they comprise the most important examples of medieval monumental painting executed in the Byzantine tradition to survive in East Slavic territories. Notwithstanding several recent publications about the Kyrylivs'ka tserkva, the monument remains gravely understudied. It has never been thoroughly or professionally photographed, the inscriptions have not been analyzed by paleographers, and the dedication and medieval images have never been considered in the context of broader Byzantine or local Rus' developments. There are so few actual medieval monuments remaining in Ukraine and even fewer with iconographic evidence from the Kyivan Rus' period that preserving the Kyrylivs'ka tserkva is a cultural priority. According to colleagues in Kyiv the current crisis unfolded in the following manner. A few years ago (2004?) the Church of St. Cyril was quietly removed from the highly protected list of the Cathedral of St. Sofiia Cultural Preserve, clearing the way for its ultimate transfer to the Ukrainian Orthodox Church of the Moscow Patriarchate. In a recent church newsletter an official of the UOCMP complained about the Vrubel oil paintings not being 'iconic' enough, and that museum restrictions prevent the burning of candles required for proper Orthodox services. The UOCMP hierarchy also expressed displeasure with the frescoes claming that they are not inspiring enough and are not reflective of the UOCMP dogma. Voicing such complaints, the ecclesiastics declared their desire to repaint the interior. It appears that Ukrainian laws governing historical sites can be manipulated so as to allow the church building to be removed from the list of historical sites following an official assessment and inventory of its worth. This apparently already has taken place as a sum of 998 hryvnias is being cited as the amount the UOCMP would need to pay the Ukrainian government for the building. Once this sum is paid the UOCMP would have the authority to remodel the interior of the monument. Expressions of concern from abroad and from ecclesiastical, cultural, academic and scholarly communities may be of some help to those in Ukraine who are attempting to preserve this monument. Dr. Olenka Pevny is a faculty member at the University of Richmond, Department of Art & Art History, specializing in Late Antique, Byzantine and Medieval art history.